Today is World Book Day - traditionally a day to celebrate literature and the anniversary of William Shakespeare's death. We at Children's Hope International have reason to celebrate. Children at over 50 schools throughout Ethiopia will be receiving much needed textbooks, shipped by cargo this month from DC. Book provider World Bank Family Network is able to make learning within reach for these Ethiopian children for the first time with the aid of Children's Hope. When the books arrive in port city Djibouti, Children's Hope will have the glad task of distributing these books to disadvantaged children who previously had limited or no access to the bound pages - which may open their minds and their imaginations. Have you read a humanitarian-themed book recently that you feel others should know about? Leave a comment and help celebrate the blessing of literature with us today. • The Boyacheks-- AL Colombia DOT 4/21/08 - New! • The Calderaros--IN Colombia DOT 4/14/08 - New! • The Derrs--PA Colombia DOT 4/26/08 - New! • The Williams--MO Russia T1 DOT 4/18/08 - New! Busy Week of Adoption Travel! 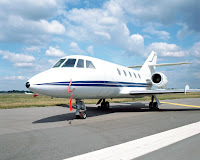 Frequent Flyer miles are piling up this week for Children's Hope families. There are 44 families on adoption trips this first week of April. * A group of 25 families are with their new children in China this week. * There are 13 Russia families who are either on their first or second trip. * Two families in Ethiopia fly home with their new babies this weekend while one family came home from Colombia on Wednesday. * Two additional families arrived back home yesterday from Kazakhstan with another family now headed in that direction today. * The Hollises--OH Colombia DOT 4/11/08 - About to leave! * The Kellers--MD Vietnam DOT 4/14/08 - About to leave! * The Williams--VA Russia T2 DOT 4/9/08 - About to leave! * The Wilsons--MD Russia DOT 4/10/08 - About to leave! For the Nothums, Friedrichs, and Brandts, I noted their child's adoption month and year in their link description. Let me know if this is helpful and I will update the Completed Families blogroll to show when families arrived home. Thank you for your input, and congratulations to all of our traveling families! The Package Enroute from CCAA? Referrals! By mail received today from China Center of Adoption Affairs, Children's Hope received seven China referrals for our families with a 1/6/06 log in date! Each of these referrals were for a beautiful little girl from the Jiangxi province. Six of these infants are 7 to 9.5 months, and one is 3 ½ years old. Their new families waited 27 long months from their paperwork log in date to this special referral day, and will now travel to complete their Chinese adoptions in approximately 8 weeks. Congratulations! Children's Hope International's families to receive referrals from China next are those with 1/13/06 and 1/16/06 log in dates. We also received official referrals for two of our waiting children families today! Congratulations to them also! It's coming. Last year 1300 parents and adopted children (from 26 states!) came together for Children's Hope International's Reunion Picnic. Be one of them in 2008. Mark your calendar for the annual picnic, July 12, 2008 in St. Louis, Missouri. The night before - gather and take the St. Louis West's Marriott by international adoption storm. The day of - eat, drink, and be merry with Bandana's BBQ and discover entertainment while both adults and kids make and rekindle friendships. This year is the year; July 12 is the day. For details and pre-registration visit the Reunion Picnic website. 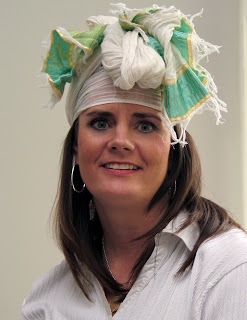 Registration is required to eat lunch, catered by Bandana's. It's only 100 days away! 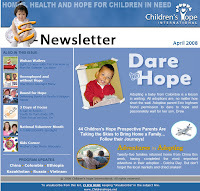 View all Children's Hope widgets. Photos from 2007's 15th Annual Reunion Picnic! Are You a Runner with a Purpose? Spring is here, and for some, that means putting on their running shoes for the hope of fitness... and this year also for the hope of children worldwide. Children’s Hope International will have a team running in the 2008 Bank of America Chicago Marathon. Runners come from all over the world to participate in this event, considered to be the pinnacle of achievement for elite athletes and everyday runners alike. On Sunday, October 12, 2008 runners from all 50 states and over 120 countries will set out to accomplish a personal dream. Running for CHI will mean running for a great cause - children in need of homes, health and hope. Become a part of something bigger this year – come run with the Children’s Hope marathon team! If you'd like to run with the Children's Hope team, register soon as the race is limited to 45,000 runners and fills up fast - VERY FAST! Bank of America expects registration to close in April. Type Children's Hope International in the fill-in box after the drop-down list of charity names. Click here for a downloadable mail-in registration form (PDF). Once you are registered, please email Mary House with your confirmation number. Not a runner, but know a runner? Share this opportunity with your friends and family. 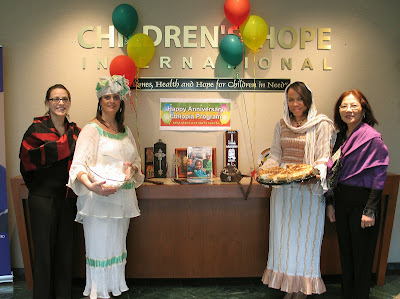 Children's Hope International seeks to recruit runners and sponsors in order to help children in desperate circumstances. It's the kids who make it all worthwhile. We hope you are all as excited as we are. Keep thinking about the kids as you do your training for this event. Remember to pray for them and for each other as we all get ready to RUN FOR HOPE!